So, how about a break from the generic meme posts I've been doing recently? Just FYI (since some have asked) I'm doing fine now, I think. I have had heat exhaustion before, and I think that's what triggered the episode last week. So now I know to keep an eye on it, and I've had so much water to drink that I am buying a Brita pitcher on the next trip to Walmart (because the tap water here is not very tasty), which will be sooner than I originally planned. Because while we've been busy unpacking and getting settled with all our stuff (sans livingroom furniture), SoldierMan's buddies who live in our same complex - call them L-1 and L-2 - are still sleeping in sleeping bags, waiting on their respective HHGs to get there. Bummer, right? So they've had dinner with us a couple of nights this week. Which is fun, because in some ways it's easier to cook for 4 people than it is for 2. But on the other hand - 3 LTs eat A LOT. So I'll be making another trip to Walmart tomorrow after the social. Anyway, back to unpacking. I *finally* got all my books unpacked over the weekend. However, it looks like a few didn't quite make the trip. The problem is, I can't remember which ones, so I don't know which ones to ask my mom to look for, or which to replace or not to replace. But yeah, those are just MY books. *sigh* I really feel moved-in now. One of the big obstacles we had when we moved was, we sort of packed up the house and threw it in storage in a day. Basically I moved out all the non-essential-for-daily-living items, then SoldierMan came home for Christmas Exodus and wanted to relax, so we waited until the last.possible.day to move everything out. Including the fridge. Which, because we were busy doing "fun" things, never got wiped down before the move. So when we went a couple of weeks ago to move it from storage to the POD...oh, the smell. But we couldn't do anything about it until it got here. And then not until I was feeling better. And couldn't even get it into the apartment until Saturday. So SoldierMan and I, armed with Magic Erasers and a big bowl of bleachy-water, went to the POD and gave the fridge a good once-over. And what did we find in the now-90+ degrees freezer side? Now, since these were airtight, I can't be sure that they contributed to the smell of the fridge. But it did smell like bad fish. And like SoldierMan pointed out, it was pretty freaky that they were the same color that they are when you pull them frozen right out of the box. But yeah. Surprise! Just so you know, we also Lysol-ed and then water-rinsed the fridge and freezer. I'm not going to put food on bleachy surfaces. :p And this is our "second" fridge since the apartments come with one. But we didn't want to get rid of it, so now it's our back-up fridge sitting in the laundry room. So, that's been my week up to now. I've got a busy week ahead of me, too. The wives stuff tomorrow, like I said. And a BB coffee date which I am super excited about on Thursday! And then SoldierMan has off Friday-Monday for the holiday. We still don't know what we will do yet. Technically, we *could* go to Atlanta or Savannah or someplace, but I think neither of us are in the mood for another road trip already. Just hanging around here sounds great. Sounds like a blast! That's always the first thing I unpack when I move somewhere, my books. 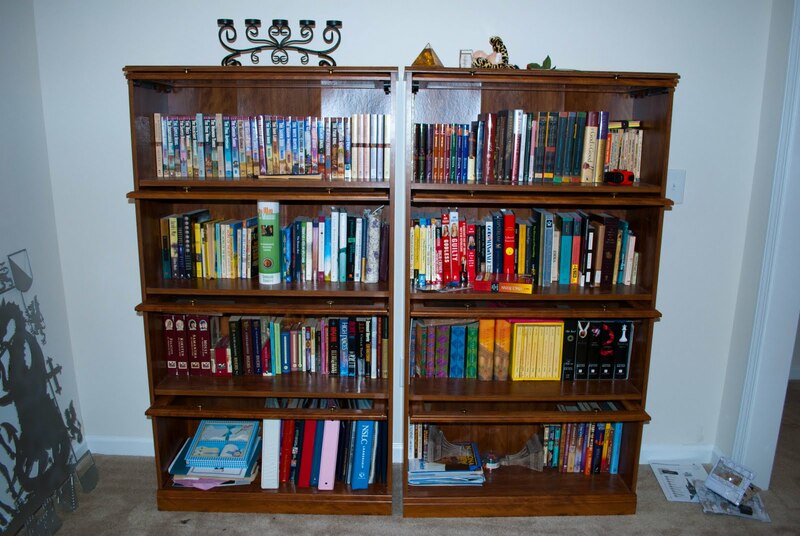 Dang look at that book collection! That's so exciting you have your first wives thing tomorrow. I would wear a summer dress, but that's because I always wear dresses they are the easiest thing to put on. haha. One article of clothing. 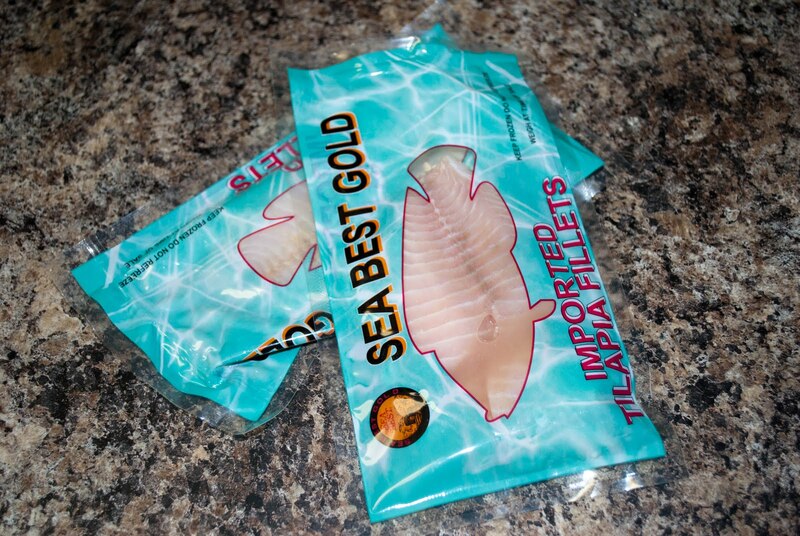 Aw I'm not sure if I will ever eat any fish that is packaged lol..Those look creepy we jsut go fishing down here in Panama if we want to eat fish lol..Aw that is so awesome that your going to a wife orentation..I would just wear like a summer dress or something.. Your sister and I were just now talking (at work) and we both agree that when everything is set up in the apartment you need to do a room by room post with pics! Glad things are going well and you are starting to settle in. So glad you are feeling better! You will be surprised with what people will wear to the orientation. YOu will be ok no matter what you wear! Oh man, the joys of moving!! You should write a book, lol! I can't wait to hear about your social!! I hope it goes great and you get to meet some awesome spouses!! but, so glad you are getting moved in!! Glad you're feeling better. And I love your bookcases! We have books coming out of our ears, and we'd love to have nice bookcases that match. How great that you have a spouse event already! I never know what to wear for those things. I don't know that I'd wear shorts, but if you wear a skirt, wear a casual one. Do you have a dressy pair of capris? I always go with capris because you can dress them up with nice shoes. Hard to say though because I don't know your crowd. Good luck and have fun! girl, it took me 5 hours to get my license, id, and stickers. and only one hour of it was getting my license!! the wives event sounds cute!1 i would wear a cute summer dress (like stephanie said). woo! im glad you got your books, i couldnt live without mine, do I spy Harry Potter and Nancy Drew?? :D awesome!! oh, and EWWWW about the fish. haha. And, uh *barf* with the fish stuck in the fridge. When I saw that picture, I just about gagged!!! Ewww! If you happen to come to Savannah be sure to email me! I would love to meet up for coffee or something. But a staycation sounds like a great idea for y'all. I know you are ready to relax!! Oh my Lord I can imagine the smell! I too am all about cleaning and disinfecting. Yay for books being unpacked!! that's funny how the guys are going over to your place for food :) the male gender would starve without us!! 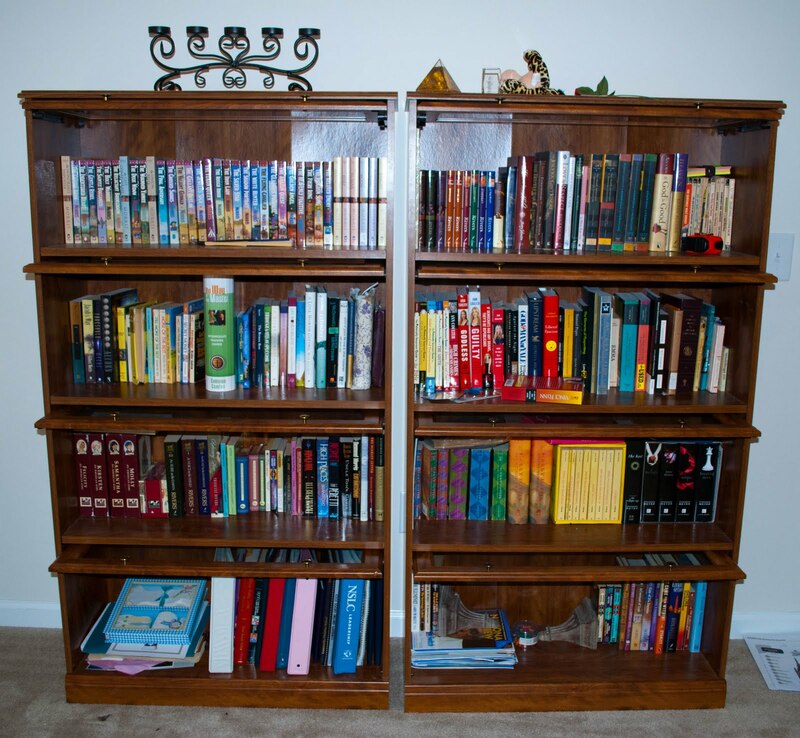 Bookshelf on the right, 2nd shelf from the bottom = LOVE! I don't even have to see the titles to be able to tell what those are! i LOVE your bookshelves - in need of some, you don't remember where you got them, do you? I'm glad you're settling in! I know what you mean about it being easier to cook for 4 than 2. I miss the fact that people are all still on leave right now, because it's just K and I. Before everyone left (about a week after they got home from deployment), we had a house full of people at any given time, and i actually MISS it. However, 3LT's DO eat a lot of food, try a few captains, a few LT's, and about 15 enlisteds. Now THAT was a big grocery bill, but it was also loads of fun. As for the attire issue, I'd either throw on a summer dress or a casual skirt. I dunno about shorts, unless they're the long ones? However, I hate the long ones, so yeah.... Ok, that was totally UNhelpful. Sorry. Yikes, sorry to hear about your incident - hope it doesn't repeat itself! But well done on the unpacking awesomeness. So exciting that you're (getting) settled in a new place! It looks and sounds as if you've been making your new house into a home! Have a great weekend!